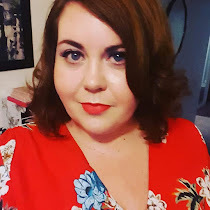 I was recently lucky enough to be asked by +Evans to review the Pink Floaty Dress from their new range from Scarlett & Jo. The hot pink of the dress is gorgeous and the fit is true to size. I would actually probably classify this dress as a tunic myself as at 5ft 4 I wouldn't feel comfortable wearing it without opaque tights or leggings. It hits me at around two inches above the knee. I've styled the dress today with black leggings and my new sandals which work well for a daytime look but equally the dress would be fantastic with a statement necklace, some opaque tights and skyscraper heels. Unfortunately due to an injured foot I can't show you that look! The dress can be found at Evans in sizes 14-26, priced at £35.00 which is a great price considering that it is a dress that can be styled up or down depending on where you are going. I will probably use this dress as a go to for when I go out in the afternoon and want to style up in the evening, without having to go home to change. What do you wear for the afternoon/evening look? Pink is sooooo your colour! it looks stunning! I'm not used to wearing pink so it was a new experience for me! Thank you, yes definately lucky!